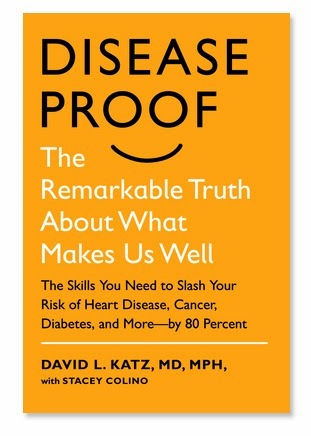 Dr. David Katz is something of a force of nature in preventive health. Among the many feathers in his overloaded cap he's the founding director of Yale University's Prevention Research Center, and my favourite front-of-package food ranking system, Nuval, is his brainchild. He's also a prolific author (countless columns and now 12 books) and he's sometimes referred to as medicine's poet laureate. So when I saw that he had published Disease Proof: The Remarkable Truth About What Makes Us Well, I had it delivered straight to my Kindle for review. For regular Katz readers, the book in a sense, is a collection of many of his thoughts and columns on the subject of healthful living, mixed with his unique brand of poetic metaphor and soundly supported by our current best available sources of evidence. Disease Proof explores the dramatic impact of what we choose to do with our forks and our feet has on both our qualities and quantities of life, and provides readers with concrete recommendations on how to improve both. "As it turns out, we are all making life or death decisions every single day in terms of what we choose to put into our bodies and how we choose to use them"
"improvements in lifestyle can lead to an 80% reduction in heart disease, a 90% reduction in diabetes, and a 60% drop in cancer rates". Choose the wrong roads in your very real choose your own adventure lives and indeed, your book could end more suddenly than you'd hoped or planned. and in an incredibly rare and refreshing chapter for a self-help book, he spends real time highlighting my favourite metaphor of his - levee building. Ultimately Katz sees our world as awash in a flood of low-quality calories and diet-related chronic diseases, and like any flood, stemming it is going to require a great many sandbags, no one of which will be able to do the job itself. As to who this book is for - it's the perfect purchase for someone who is truly at square one in healthful living and is ready to try to change their personal destiny, or it's for someone who has been so discombobulated by conflicting information, sensationalized media reporting, and overzealous diet gurus, that they no longer know who or what to believe. If you'd like your own copy, here's an Amazon Associates link.